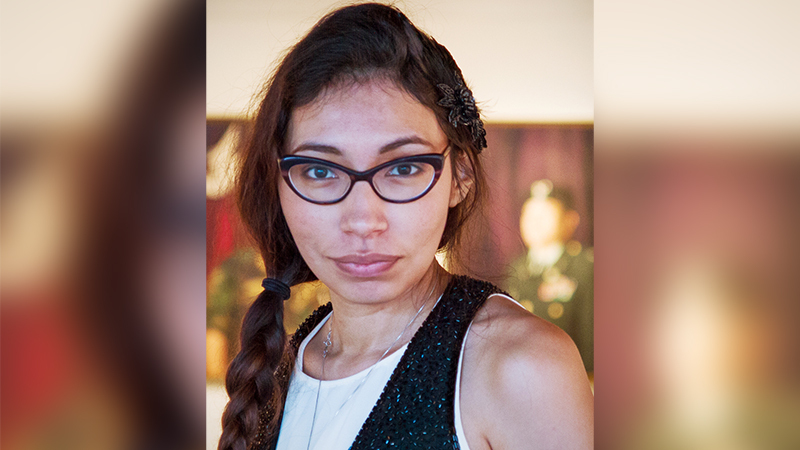 Marlena Myles (Dakota, Mohegan, Creek) has served as one of the core artists at the heart of the Horse Nation of the Očhéthi Šakówiŋ exhibition. Myles began her career as a portraitist, using traditional mediums like charcoal. Her work evolved, however, when she discovered the possibilities of creating art in digital formats. Today, in addition to working as an accomplished graphic designer, she produces vibrant digital vector drawings, devising complex geometric shapes to create images rooted in Native themes. Myles believes in using art to build cultural awareness—and she knew immediately she wanted to be involved in developing the Horse Nation Exhibition. She was inspired by the stories and histories of people across the Očhéthi Šakówiŋ (or Seven Councils Fire) illuminating the unbreakable bond between people and the Horse Nation. Drawing on that inspiration, she created three pieces for the show to honor that bond and celebrate the horse as a spiritual relative. We sat down with Marlena to discuss how she discovered her voice as an artist, how Native art can—and must—evolve, and what the Horse Nation experience has meant to her. Thanks for sitting down with us today, Marlena. Could we start with a bit about you, and how you discovered your passion for art? I was born in Connecticut, and my dad was from the Mohegan tribe. He passed away when I was very young and so my mom—who is from Spirit Lake—moved us back to Minnesota so we could be closer to her family. Later we moved again to Rapid City, South Dakota. Our neighborhood wasn’t the best or safest and crime was a problem, particularly for Native kids. My mom always made sure to have art supplies and musical instruments for us so that my brothers and I could stay indoors and out of trouble. So as a child I was always creating my own artwork. I’m definitely a self-taught artist. In school I was encouraged to take science classes and to focus on my musical abilities, and art always fell to the background as a hobby. Art came to me very easily so I really focused myself on the subjects that challenged me more. But after high school, I realized art should have been my main passion all along—and it quickly became a focus not only in my personal life but in my career as well. Clearly your art has evolved over time. You began doing portraits using more traditional mediums, but now you work in digital art. Tell us how that evolution took place. I focused mainly on portrait drawings for a long time, but I had friends who were doing digital art and, after seeing their work, I started asking them about their methods and how they were creating their images. At that point I got addicted to making vector drawings. To me it’s a real, true form of digital art. There is a type of digital art that attempts to imitate more traditional mediums—like oil paintings or charcoal drawings. But vectors are based on mathematical formulas, so they are not something you could necessarily do by hand. That’s why I love this medium—you are creating completely original works that don’t imitate anything else. You say in your artist statement that “art is a method of teaching cultural awareness.” Why is it so important to represent Native cultural identity through art? I believe art needs to evolve as Native people do, and to reflect our lives today as well as our history. We don’t live in tipis any more, or hunt buffalo, but the art that people associate with us is always very traditional and usually incorporates those stereotypical images. Art needs to stay with us and continue to be a part of our changing reality, instead of being stuck in the past. I think using digital art is a way to present a more modern interpretation of Native art and the lives we live now. It’s also a way to engage the next generation in learning about our culture and heritage, and how it informs who they are. I want to encourage and inspire children to learn about art and the reality is that children are always on computers now, using them as a means for expressing themselves. Teaching children the stories of their ancestors—and then using those stories to inspire new art and creation—is a powerful way to connect children to their culture, to help them relate it to their lives today. Over the last year you’ve served as one of the core artists creating the Horse Nation of the Očhéthi Šakówiŋ exhibition at The Heritage Center. How did you hear about this project and why did you want to be a part of it? Before I heard about the Horse Nation exhibition, I created a piece called “His Red Nation,” which is about the 38 Dakota warriors who were hung in Mankato, Minnesota in 1862. I participated in a horse ride to commemorate that part of our history and used a photograph I’d taken of the ride as a reference to create a modern vector illustration. I’d always thought that, in Minnesota, the history of Dakota people wasn’t covered extensively in schools, and so many people don’t actually know about the Mankato hangings. After creating that piece, I saw that Keith BraveHeart’s Horse Nation documentary was being put together. I reached out to connect with Keith about this piece that I had created—and it really fit in with what he was doing, in looking at how horses have been a relative to people across the Očhéthi Šakówiŋ. And once the documentary was finished, it really resonated with me—particularly the way that horses helped children reconnect with Native culture and in helping to heal them after incredibly traumatic events in their lives. I wanted to be a part of the larger process in putting the exhibition together; to use art to describe the strong bond between our people and the Horse Nation. Being a part of this exhibition has been quite a journey. What has inspired you along the way? When I submitted my first vector piece to Keith, I was a very unknown artist and I wasn’t really pushing my name out there. But throughout this process, I was able to meet really prominent and established Native artists like Donald Montileaux and James Star Comes Out, and they have taken a liking to my own art. Vector art is new to many them, and hearing their reflections on my work has helped me grow as an artist. As a group, we worked closely to put the exhibition together and it was incredibly inspiring to listen to these artists speak about the importance of expressing through their work what it means to be Native. And it is humbling to be considered a part of the next generation of contemporary Native artists who will take on that responsibility going forward. This exhibition was directly influenced by the stories and voices of Lakota, Dakota, and Nakota people across the Očhéthi Šakówiŋ and their relationship to the Horse Nation. How did you find those voices inspiring your work? I had the honor of attending a community gathering of women here in Minnesota, and the women who came and spoke all had a very deep connection with the Horse Nation. Horses helped them to heal from tragedies in their childhoods and helped them to become better adults and stronger people. I didn’t really grow up around horses but I really empathized with what they were saying. And as an artist, I don’t necessarily need something to be my own personal experience to be able to relate to it through my work. I listened carefully to them and then used my artistic skills to channel what they were saying and to bring their energy into my pieces. Ultimately my goal is to pass that energy on to the people who stand and look at my art in the gallery. I hope those community voices will come through in my images. You have three pieces in the show itself—what was the inspiration and story behind each one? The first piece is “His Red Nation”, which was inspired by the 38 Dakota warriors memorial ride as I noted earlier. It shows an elder male holding a child, to capture the idea of how elders pass along knowledge to the next generation. In the background there are 38 little morning stars to symbolize that we’ll never forget those warriors and their sacrifices. “Northern Lights Horse” is an homage to my reservation, and my memories of growing up there as a child. My cousin used to say that, if he whistled, the Northern Lights would dance—and so we’d try it again and again. I think the piece shows our connection to the heavenly world. I represented the Northern Lights as a horse because I thought it was a good way to help people understand the spiritual power of the Horse Nation. Finally, there is “All the Stars Warrior,” which includes a reflection of a horse in the water. There are many stories that recount how, when a warrior passed away, often their horse passed away shortly after. People said that was their horse going with them on their journey into the afterworld. I wanted to create a visual image of the deep connection between people and horses, and show how what we do in this life reflects in the next one. How has being a part of this exhibition changed your perspective as an artist—and how do you imagine will it inform your future work? Being a part of this show has definitely helped me grow as a person and as an artist. Now I realize that my artistic abilities can help me connect with the past and illustrate elements of our cultural history in a way that young people can understand. I’ve discovered that children really love my art—during the Horse Nation exhibition’s opening reception, kids were pointing and telling their parents to come hurry up and look at my vector drawings. With what I do I can connect with kids easily, and that quickly opened up my eyes to wanting to work on illustrating children’s indigenous language books. I’d love to be able to contribute to books that parents can then read to their children—to teach them about their Native language and to reclaim their indigenous languages as their own. This experience was extraordinary because Horse Nation is really the first exhibition that’s involved all of the Očhéthi Šakówiŋ. It’s something that brought us together to have a chance to represent ourselves and share our perspectives as relatives. I’ve listened closely to everyone’s stories as a part of this process and it’s made me want to ensure that my art is something not just about me. I want to make art that belongs to all of us.